I know what you may be thinking. Just what is that title all about? It is not the serial number of the C-124 picture here. It is an address of sorts, but you can’t find it on Google maps or with your GPS system. It also represents a destination, of sorts, for myself and my family. It took over 61 years to get this address and on last Monday, March 26th, 2012, my family took possession of this address for the first time. On Good Friday, March 23rd, 1951, an Air Force C-124 took off from Maine on its way to an airfield in England. The plane was carrying 53 airmen as passengers and crew. The passengers were all assigned to the Strategic Air Command and were accompanying Brig. Gen. Paul Cullen to establish a new SAC Air Wing in England. Somewhere over the Atlantic, the plane reported that a fire had broken out on board and the Mayday signal went out. Approximately 6oo miles West of Ireland the plane ditched in the ocean and according to the official accident report, all hands exited the plane safely and made it into the life rafts. Shortly after the men were in the life rafts, a B-29 pilot out of Ireland spotted the rafts and the flares that the men had ignited. Their location was reported and the pilot left the scene when his fuel was getting low. This should have been the beginning of a great rescue story, but no other United States or Allied planes or ships made it to the ditch site for over 19 hours. When ships accompanying the USS Coral Sea finally made it to the scene some 19-24 hours later, the life rafts and the men were nowhere to be found. The official accident report that was fully classified for some 50 years, states that there was some debris found in the area, but there was no sign of the crew or the passengers. The search went on for several days and Western Union telegrams were sent to the families of the men on board detailing the extent of the search activities and efforts. But the searches were unable to turn up any evidence of what happened to the 53 souls on board. The only evidence that the men were there was a valise that was found that had the name of one of the passengers on it. The valise belonged to my father, Captain Lawrence E. Rafferty, who had also been a veteran B-24 pilot in World War II with 50 bombing missions to his credit. Over the last 61 plus years, the families of the men aboard searched for answers, but the Air Force kept the report completely classified for half a century. Parts of it are still classified to this very day. The family was originally told that the plane had crashed into the sea and no one survived. Unfortunately, when the report was partially declassified the families were able to learn that the men were safely in rafts and the plane landed in one piece in the sea. Our family and the surviving family members of the other patriots on board the ill-fated C-124 flight are still searching for answers. There is now circumstantial evidence that the airmen may have been “snatched” by our Cold War foes in the Soviet Union for their intelligence value, but their fate remains a sad mystery. The purpose of this story is not to rehash the unanswered questions from the accident, but to highlight the wonderful experience that we had on March 26th, 2012. As I mentioned above, we took possession of a special address noted in the title. That address is the location of a memorial stone that now stands on a green hillside in the Arlington National Cemetery. After finding out that my Father had never received a memorial from the Air Force, I learned from family members of other victims on board the C-124 that he was entitled to an Air Force memorial service with full military honors. 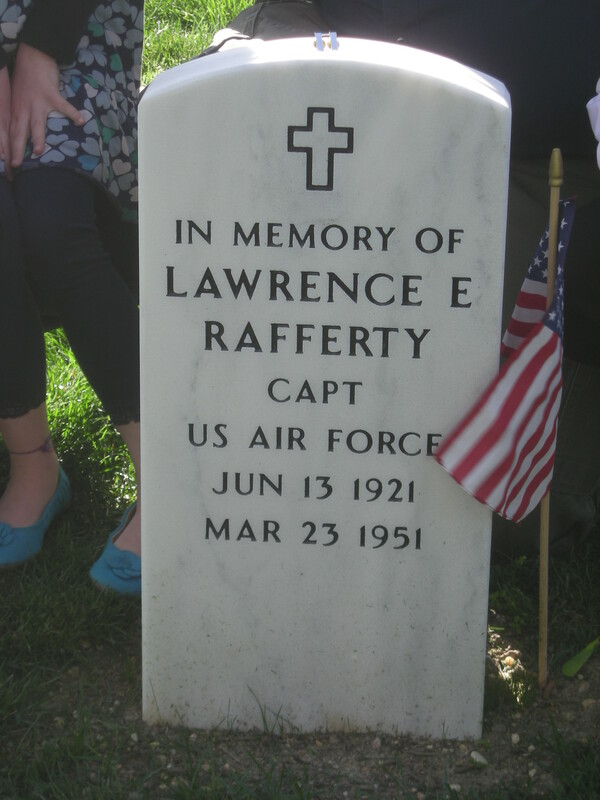 Upon looking into the matter and after contacting a wonderful Mortuary Affairs Specialist at Dover Air Force Base, our memorial was set up and reserved with Arlington National Cemetery. Last Monday, on a sunny and breezy Washington, DC day, my Father received his honors. We followed the caisson and the marching band in our procession to the memorial site and witnessed the 21 gun salute. My Mother who turns 89 next month was able to see Washington, DC for the first time accompanied by 60 members of our family and friends. My Father’s sister, my Aunt who is 93 also made it to the ceremony and the sight of her and my Mom sitting at the memorial site and receiving the folded flag from members of the Air Force Honor team will forever remain with me. Although we do not yet have all the answers to our questions, our family’s patriarch is now forever memorialized. From this day forward, my Dad’s legacy will be forever etched in our hearts and now in stone. It may have taken us 61 years to get it done, but on Monday, March 26th, 2012; he made his final flight home. Welcome Home Dad. Thanks for the link to the B-24! raff, I thought about you all day that day. I still have mixed feelings. I really wanted to be there, but don’t think I could handle it right now. Feelings are still too raw and close to the surface on many levels. I want to share with you a photo I took. 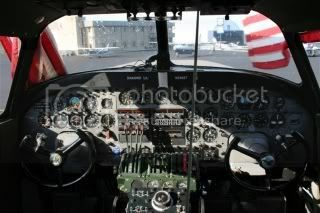 This is the “front office” of the B-24 bomber owned by the Commemorative Air Force. Your dad would have been a co-pilot for a while, then after a time, promoted to the left seat as pilot in command. I love the Liberator. It could fly higher and faster than the more popular B-17, and carry a heavier bomb load. rafflaw, what a wonderful tribute. I’m sorry I was not able to witness it. rcampbel, et al. Thank you for the kind words. It was especially gratifying that my Mother and my Aunt Rosie were able to attend. I only wish that Rosie’s sister, my Aunt Catherine, who is 96 years old, was well enough to join us. I am inspired thank you! Thank you for sharing you very personal story. I am glad your family has some degree of closure and especially that your mother and Aunt are still here to feel that and to take part in the ceremony at Arlington. Thanks for your kind words. It was comforting for me and for my family to have his memorial marker put in place and for his ultimate sacrifice to be noted with the military honors. I was blown away by the care shown by all of the members of the honor guard, including the Chaplain who was wonderfully caring to myself and more importantly to my Mom. Now we get back to the job of uncovering the rest of what we do not know. But you are right. A weight has been lifted and it feels good. Reading your Father’s story again moved me. It is finally a fitting tribute to a man of proven substance and courage. Fifty missions is in itself a testament to those qualities. It leaves me sadly pondering the effect his mysterious loss had upon you, your Mom and the rest of your family. While this brings some long due closure, the unneeded secrecy for all these years is disgraceful treatment of brave servicemen. I feel privileged that you were kind enough to invite me to share in this momentous event for the Rafferty family and sad that I missed it. Thank you for sharing this on the blog and praise to the efforts of the entire family in persisting all these years to uncover the truth about a man and men, who had earned the right to better treatment from their country. A momentous injustice has been partially uncovered and redressed. Thank you for sharing this wonderful part of your life with us. I am so glad that you were able to bring him home, to rest where he belongs. Well then. A little less anonymous than usual. And here I thought “The Killing” or “Game of Thrones” was going to have my biggest surprise of the evening. The answers are hard to get, but we will get them…eventually. Thanks. Sorry to reply as late as I did, yard work….birthday party (5) five year old…..dinner….and shopping…… It is truly wonderful….about your dad…. Thank you for sharing such a wonderful tribute to you and your family. I am pleased that there is some comfort and a conclusion…..
Has the DID/DOW answered any questions as to why it was classified and is still being kept classified? Again, thanks for sharing a beautiful ending by a very proud son…..
“Day is done, gone the sun . . .”; but the son did good. Muy bien, RaffLaw. Muy bien. i grew up air force myself (my dad was mac not sac). even lived at dover afb back in the 60’s. it’s good you got at least part of the story. fifty missions was no small feat. I don’t know why it sn’t on the website. The only thought is that I USA memorial site and not a grave site. Thank you and thanks for your Dad’s service. Thanks talkindog! It was an emotional time for all of us. Even after so many years.